Sandstone Mountain is in the Appalachian Mountains. 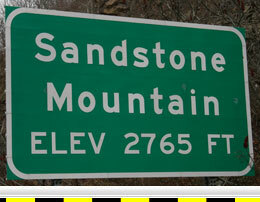 Sandstone Mountain is located on Interstate 64, approximately 12 miles east of Beckley, West Virginia. The steep grades at this location consist of an eastbound and westbound descent into the New River Valley. The eastbound summit is Sandstone Mountain and the westbound summit is an unmarked mountain. 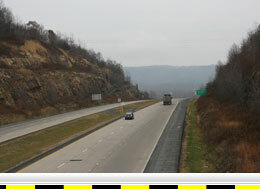 Westbound I-64 from the unmarked summit has a vertical descent of 1,058 feet over a distance of 10.1 miles. 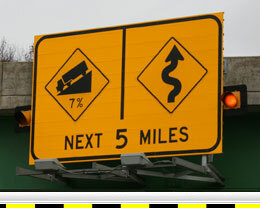 The reported grade for the westbound descent is 7% for 4 miles. This grade is a steady descent for approximately 4 miles, where it changes to a lesser stepped descent for about 6 more miles before reaching its base at the New River bridge. No advanced warning of this steep grade is given at the summit and the only indication of the approaching steep downgrade is a RUNAWAY TRUCK RAMP sign that precedes the summit. The first grade warning sign is on the downgrade just west of the summit. Additionally, the one and only runaway truck ramp on this grade is less than a mile from the summit. Since the steepest part of this grade is the two miles beyond the runaway truck ramp, the location of the ramp suggests that truck drivers are often quickly surprised by this steep downgrade. Eastbound I-64 from the Summit of Sandstone Mountain has a vertical descent of 1,433 feet over a distance of 4.6 miles. The reported grade for the eastbound descent is 7% for 5 miles. This grade has a steady steep descent for nearly 5 miles before it flattens near the New River Bridge. This grade has advanced warning signs for several miles and also has a mandatory brake check station at the summit.